The PXM209/PXM219 series has been discontinued. Please see the PX309 series as a possible alternative or contact our Technical Sales department. 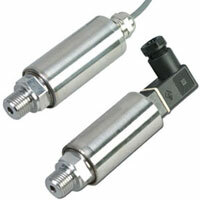 The pressure transmitter of the PXM209 Series general purpose are accurate, highly reliable general purpose voltage or current output transducers suitable for harsh industrial equipment applications. Their high performance is a result of the soild state full bridge construction which uses a micro-machined diffused silicon diaphragm and unique thin-film media with dielectric isolation barriers. The proprietary ASIC provides a wide temperature compensation including tight tolerances for zero balance and span.